Grumman TBM-1C Avenger bombers of squadron VT-18 led by Lieutenant Commander Lloyd W. VanAntwerp flying from USS Intrepid (CV-11) attack airfields in Okinawa. Air Group 18, led by Commander W. E. Ellis, has Grumman F6F Hellcat fighters and and Curtiss SB2C Helldivers nearby. This was part of a campaign to suppress Imperial Japanese Navy and Army Air Force aircraft from reinforcing Leyte once the invasion began on October 20, 1944 (A-Day). By arrangement with Fleet Admiral Chester W. Nimitz, the Carrier Task Force from Admiral William Halsey's 3rd Fleet was to strike Coron Bay and other targets innorthern Luzon, Okinawa and Formosa, from A Day minus 10 to A minus 7. 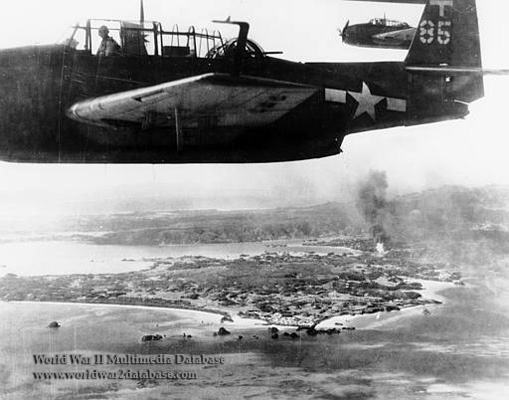 Heavy opposition during the attack on Kiirun Harbor in Formosa on October 12 led to the loss of several aircraft from 3rd Fleet.